Football jigs have a shape like a, guess! Yep, a football. Why a football? This shape is far less likely to "hang up" than are other lead jigs with round or bullet shaped heads. Now that doesn't mean their good for all circumstances. They are absolutely not intended for fishing in grass or other forms of thick vegetation. But for hard, rock strewn, gravel covered bottoms they can't be beat. 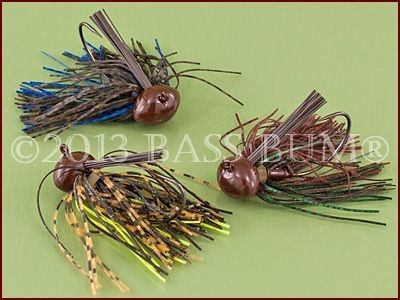 They're lead jigs designed to get to the bottom fast and to stay there. If you do get hung-up with a football shaped jig head it is easier to get loose by jiggling your line or reversing your direction and passing back over where you are hung. This enables you to pull it free from the same path it went in. The reason most bass fishing jigs hang up is that they flop over on their sides once on the bottom. When the hook is then laying on its side on the bottom it's more likely to snag on a limb or brush limb or anything else that might be sticking up from the bottom. Additionally, when lead jigs are retrieved through the water and hit a limb they will have a tendency to flop right or left placing the hook in a position to snag the limb or stump. Football shaped lead jigs are far less likely to, in fact, it's almost impossible for them, to flop on their sides. They tend to keep the hook upright, especially when combines with a buoyant plastic trailer. 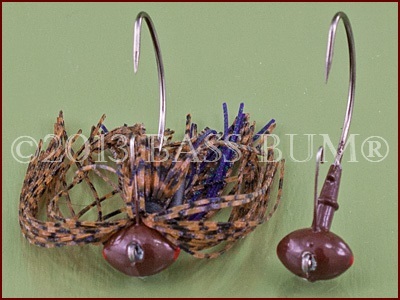 So what makes a jig head shaped like a football so effective? The term "effective" must be qualified. It is not effective in grass. It is very effective on hard bottoms covered with rock, shells, gravel and on ledges. It's a great tool for stair stepping ledges. The wide football head (center above) positioned perpendicular to the hook works almost like a rake if fished in grass. It grabs and holds grass tenaciously and seems to have an affinity for grabbing hold of wood and brush as well. If there is a small "v" where branches join in brush I guarantee you'll get hung there. It's the law! At least it seems that way. The head can't get around the "v" and if you jiggle it too much the hook impales a branch. Then you're really screwed, especially if you are using a jig without a brush guard. It's best to just avoid such conditions with a football jig. Other jig designs with elongated heads, like an Arkey (Arkie) (right above)or even a round head (left above) aren't nearly as bad about this. Go with them instead. When and Where Do You Fish Football Head Jigs? If you're going after deep water bass reach for a football jig. If you're after them in shallow water in spring, reach for the football head jigs. If it's cold and windy, a football jig. Calm, warm day, reach for the football head jigs. In other words, fish them all year long. Where are the best places to fish that offer the greatest chance of catching bass? Edges, including grass edges, channel drops, around brush piles, just outside docks and around the circumference of humps. An important point about grass edges. Drag the lure just outside the grass edge. Don't work your jig into the grass. If you do you're asking for some frustration. Ledges are great for these jigs, especially if they stair step. Cast to the bank, strip out some line so the jig falls straight down. Take up slack and start your retrieve. When you've dragged it to the edge of a step and feel it fall off then again strip out line so it drops straight. You must be a line watcher here as the strikes often occur on the fall off the ledge. Rocky Slopes 45° slopes that are covered with chunk rock and rock transitions attract crawfish which in turn draw bass. Ideal territory for football jigs. Rocky Points are ideal for football head jigs. They were designed with hard, chunk rock strewn bottoms in mind. They're good for lake floors covered with shells and and gravel too. Football jigs are by their very design incapable of falling over on their side. They don't have sides! The design is such that they literally "stand up". When at rest (right jig head above) their hooks are extending upward at an angle from the jig head. As they are worked across the bottom, when coming into contact with an obstruction be it a rock, small crevice or a thick gravelly bottom, the lure stops but the hook, adorned with a trailer, continues moving upwards and forward as the jig head rolls forward in place against the obstruction. This places the plastic trailer off the bottom moving and appearing like a live creature (left jig head above), especially if its one that is buoyant. How Do You Fish Them? - "Dragging",this is the traditional way to fish a football jig. Literally, while keeping your rod tip high at the 10:00 or 11:00 or low at the 7:00 or 8:00 position (which, is personal preference) you drag the lure across the bottom taking care to keep it in contact with it most of the retrieve. It's an attempt to imitate a crawfish moving along the rocky structure they love so much. If you feel your jig stop against a rock let it sit motionless for a moment. Then jiggle it before resuming your retrieve. Bass sitting by watching it may strike when it starts to move. Experiment with the rate of retrieve. Let the bass tell you how they like it. - Hopping is a retrieve technique often combined with dragging. As you retrieve your jig you incorporate a few hops by pulling you rod tip back six to eight inches with three or so quick pumps. You're not really lifting the tip, which would lift the jig upward off the bottom. This pumping action pulls the lure just off the bottom and across its surface, just like a crawfsh moves. The retrieve is designed to imitate a crawfish moving across the bottom. If you have seen craws move you know they scoot along the bottom in a pulsating, undulating motion by thrusting with their tails beneath them. They're not hopping straight up. They thrust with their tails which propels them gliding just above the plane of the bottom from rock to rock, crevice to crevice. - This is an aggressive action where you actually jerk your rod upward about a foot to eighteen inches with a an exaggerated motion lifting the jig off the bottom. You then allow it to fall. Strikes can occur on the fall. - Swimming jigs is a relatively new jig technique especially when talking football heads. The concept of "swimming" a jig is to keep it moving near the surface just over thick, shallow vegetation and not dragging along the bottom as football style jigs are designed to do. However, slow rolling one that's 1/2 or 5/8-ounce just above rip rap or a chunk rock bank can be productive during pre-spawn. Basically, though, "swimming" is the use of 1/2, 5/8 or 3/4-ounce football jigs at the end of long casts. They're retrieved just above the lake floor with occasional drops to the bottom, where it lies still, but for a short instant, before resuming its retrieve. Swimmers are usually dressed up with baitfish colored skirts and a corresponding color grub trailer. Even a white or silver head. These also usually have a thinner and more flexible brush guard. As with most bass fishing situations the clarity of the water is the determining factor in color selection. Some of the most popular jig colors in clear water are shades of green and brown, sometimes with a little orange or red thrown in. Black and blue dominate in stained, even muddy water. If you're swimming jigs move toward baitfish colors. As with all bass fishing situations color choice is a very personal thing. Use what you have confidence in. An interesting note on color. Most baitfish, as well as crawfish, have light colored bellies. Maybe not pure white but certainly dirty white or light gray. It never hurts to include a bit of white or light gray in an color scheme you're doing on a jig yourself. As for bulk, you can change the profile by using more or fewer skirt strands. Additionally, silicone strands behave in the water differently than do living rubber strands. Maybe it's just me but I swear jigs with mixed skirt material gets more strikes. I like to combine rubber and silicone strands, thick and thin strands, solid color and mixed color strands, even throw in a small number of flashabou strands for a hint of flash. Sort of like mixing up ingredients for a marinade sauce to put on that pork loin you're going to cook. Trailers are a matter of personal confidence and preference. Try and match the trailer color to that of the skirt if possible. Plastic trailers can be large, such as G. Yamamato's Spider Grub, Netbait's Paca Craw, YUM's Money Craw and ZOOM's Grass or Speed craws just to name a few. 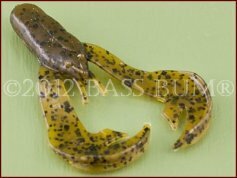 Any single or double tail grub 4" or 5" long are good choices as well. An important consideration with jigs is the method by which trailers are held on the jig. 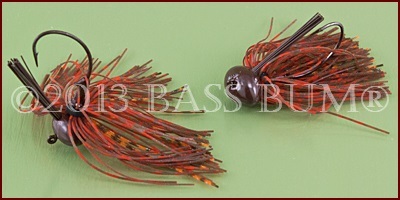 Many have "keepers" that hold plastic trailers in a fashion that makes the jig weedless. 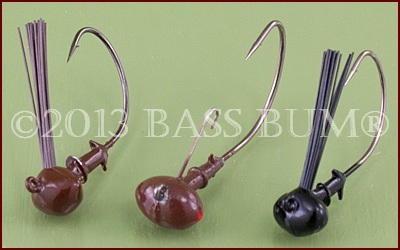 An example is the Critterbait football jig shown at right. The best rod? Again it depends on each bass angler's personal preference, though there are certain guidelines that can point you in the right direction. If fishing your jig deep you'll need a long (7' to 7 1/2'), stiff rod so solid hook sets can be made when a lot of line is out. While some will use a "flippin stick" a medium-heavy rod with a good backbone will work just fine. As for line, fluorocarbon is a good choice. It sinks, is very abrasion resistant and strong. I use anywhere from 8lb to 14lb fluorocarbon as my main line on a heavy spinning reel, not as a leader. Other jig fishermen choose to use braid with a fluorocarbon leader. My rigs are (1) G. Loomis IMX SJR 844, 7'7" heavy/fast rod rated for 10-17lb line and 1/4-1 ounce lures coupled with a Team Daiwa Advantage 4500S spinning reel and (2) Team All Star TAS 845ST, 7' medium/fast rod rated for 6-17lb line and 1/8-5/8 ounce lures coupled with a Team Diawa 3500 spinning reel. I also use the first one for Carolina rigs. I know guys that prefer shorter rods (6'6") for their football jig fishing and wouldn't even think about using a spinning reel. Like all things bass fishing, it's an individual sport, so experiment and find tools that provide you comfort and confidence. Baitcasting reels that have higher gear ratios (6.4:1 to 7:1) perform well when fishing these bulky, heavier jigs. The strikes are usually at long distance and you want to be able to take up slack rapidly.